With our custom printed window boxes at Business Image Printing you can ensure that any type and kind of your products is given the stylistic and high-quality custom packaging it needs to stand out from the competition. With the help of your team of highly-trained experts and a variety of quality resources and materials at your disposal you can be sure that for the best in custom printed window boxes and packaging. Just give us a call at Business Image Printing and we can get started on making the perfect custom packaging complement for your products. With custom printed window boxes you can create box design templates with custom die cut windows made to make sure your product isn’t just seen by potential customers as a simple image but actually seen in its physical state. With die cut windows included with your custom printed packaging you can add a fun and creative effect to your product’s packaging with hardly any effort at all. From designing the box template itself to what’s printed on it the choice is entirely yours so that while you focus on the look of your product’s custom packaging we can work on the execution. We also offer free mock-up samples of your custom packaging sent directly to you anywhere in the United States; so that we can make sure that your custom packaging matches your tastes and preferences exactly. 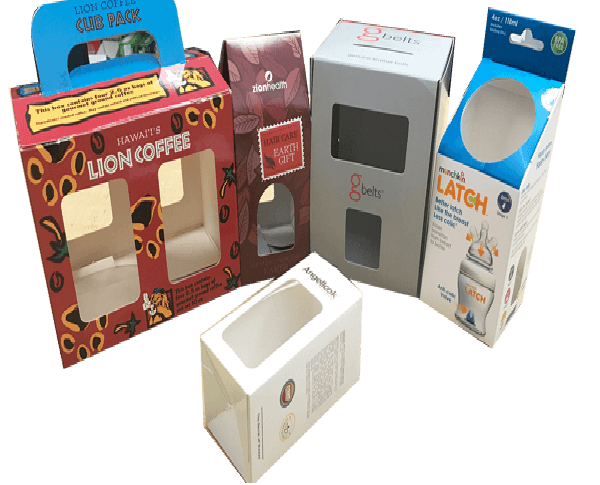 So for quality custom printed die cut window boxes and packaging at affordable prices and fast turnarounds, Business Image Printing is a place. For more information regarding any special additional features such as spot UV coating, hot stamp foiling, or embossing, feel free to contact us for more details.